Super Low-Profile all LED mini-bar with multiple patterns to choose from, including simulated revolving and random flash. 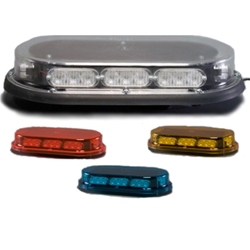 Includes dash-mount pattern-changing button and TRL technology, which maximizes the brightness and visibility of the LEDs. Also incorporates new AGP patterns. Poly carbonate dome, painted steel base. Standard unit comes in 12V-24V DC. This product is made to order. Please allow 7 to 11 business days for factory assembly.